6 Years After Museum Heist, Missing Picasso Possibly Found In Romania Thieves entered the Netherlands' Kunsthal in 2012 and made off with seven paintings, allegedly later burned in an oven by the ringleader's mother. Now the story has taken another strange turn. 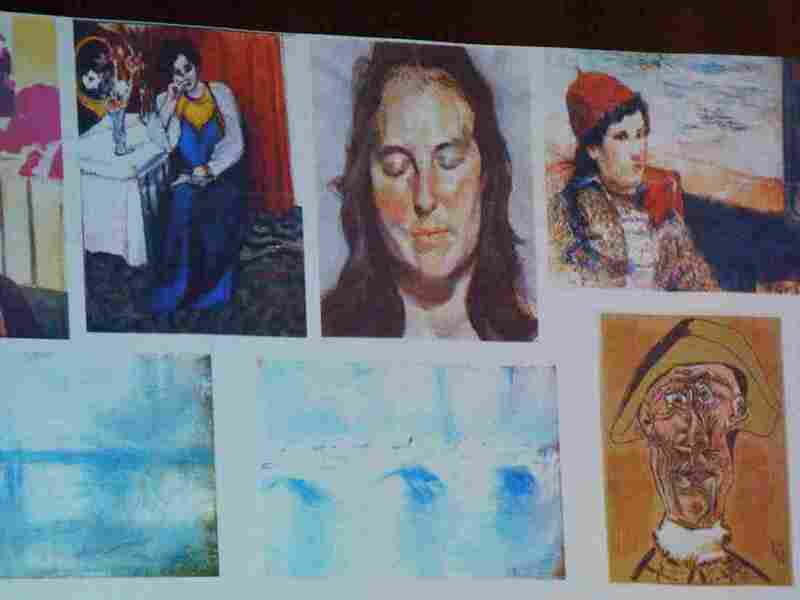 An image shows the paintings stolen from the Netherlands' Kunsthal museum in 2012 — including Picasso's Tête d'Arlequin at bottom right. Two Dutch citizens claim to have found the missing Picasso work, Romanian prosecutors said on Sunday. In a 2012 heist, thieves entered the Kunsthal museum in Rotterdam and made off with seven works by masters including Henri Matisse, Claude Monet and Paul Gauguin — as well as Tête d'Arlequin, a 1971 painting by Picasso. Authorities put the work's value at about $900,000. The circumstances around the Picasso's re-emergence over the weekend are a bit odd. "[Prosecutors] said two Dutch citizens arrived at the Netherlands Embassy in Bucharest with the painting, saying they had found it in the southeastern Romanian county" of Tulcea, Reuters reports. The Associated Press adds: "Romania's Directorate for the Investigation of Organized Crime and Terrorism said Sunday it was examining the circumstances of a painting a fiction writer said she found under a tree after receiving an anonymous tip." Four Romanians, including alleged ringleader Radu Dogaru, have been sentenced for crimes related to the paintings' theft. Dogaru's mother, Olga, said she put the paintings in an oven and burned them as police closed in. She later retracted her statement, but not everyone was convinced. "Olga Dogaru describes how she made the fire, put wood on it and burned the paintings, like she was burning a pair of slippers," Romanian art critic Pavel Susara told the AP in 2013. "She's either a repressed writer or she is describing exactly what she did." In 2014, a Romanian court ordered the four to reimburse insurers about $20 million for the paintings. But Catalin Dancu, the lawyer for the Dogarus, told Agence France-Presse the ruling would be contested. "In the first place, we don't believe the stolen paintings were the originals. Secondly, it is up to the museum to pay because it took the stupid risk of displaying the artwork without a proper surveillance system," Dancu said. During the trial, Dutch newspaper NRC reported that an analysis of the ashes from Olga's oven showed that at least three or four canvases had been burned there — but that authorities would not be able to be prove definitively that it was the stolen Kunsthal paintings that had been burned. And the fates of the Picasso and Monets were even more mysterious, because they "were produced on board and paper, which wouldn't leave any traces if burned." Prosecutors say the recovered painting is being examined for authentication.